As expected, Xiaomi on last Friday launched three Redmi models; Redmi 4, Redmi 4A and Redmi 4 Prime. The phones were released at an event in Beijing, China. All Redmi phones have premium metal builds, though, Redmi 4 and Redmi 4 Prime both have the same identical unibody design along with 2.5D curved glass displays, hybrid dual-SIM slots, and a fingerprint sensor on the rear panel. However, there are differences when it comes to display resolution, memory, processor, and inbuilt storage. Both smartphones run MIUI 8 based on Android 6.0 Marshmallow, and will be available in Gold, Grey, and Silver colour variants. The Redmi 4A is the cheapest of all amongst the Redmi 4 Series. It is much like the Standard Edition and has the looks of Redmi 3 or 3s. It has a 5-inch 720p display with 2GB of RAM and 16GB of storage and uses a 13-megapixel camera module. It’s powered by Snapdragon 425 and has a 3,120 mAh battery. The killer point, of course, is the price, which stands at just $74. If it was avaialble globally, it would be the best entry level phone money can buy considering the superior build quality and very good specs. The new Redmi 4, being the Standard Edition, does not feel too unfamiliar. In fact, in terms of specifications, not much has changed from the Redmi 3. Redmi 4 has copied most of the features including the 5-inch 720p screen and has the same configuration, which includes 2GB of RAM with 16GB of internal storage. Similar to its predecessor Redmi phone. The camera however is upgraded and uses a different 13-megapixel Phase Detection Autofocus sensor module and a 4,100 mAh battery. The processor is different too. Instead of Snapdragon 616, Xiaomi has opted for Snapdragon 430 which may not be as powerful but is more battery efficient. The design has been altered to include an always on fingerprint scanner at the back while the refined metal design makes it look like a premium offering several times its actual price. The phone costs just $104, which is remarkable considering the build. The Redmi 4 Prime is slightly expensive compared to the Standard Edition. It sports a 5-inch full-HD (1080×1920) display, and is powered by a 2GHz octa-core Qualcomm Snapdragon 625 SoC coupled with Adreno 506 GPU and 3GB of RAM. It comes with 32GB of inbuilt storage, something not seen in the given price range. Internal storage is also expandable via microSD card. It also offers Bluetooth v4.2 connectivity, but apart from this, all other specifications match the Redmi 4. Redmi 4 Prime costs $132 when it goes on sales in China later this month. Is it available in Lahore? waiting for the xiomi redmi 4 launch in pakistan. r u selling xiomi mobiles in pk? Tou black lebal shehd chalay ga? km se km available tou hai bani gala ki taraf. From where are you quoting the price? suna hy re launch horhay hain pakistan main? Yar koi pata sakta hy k ye Pakistan mein Xiaomi available hein ya nhi? Aur agar hein to kaha se milega? ? Bhai Dubai main agya hai officially. Koi jan’ny wala aarha ho tou mangwa lain. Mein ny bhe yehi Trick lagai thi. Dubai main ye model launch ho gya ho ga? aap ny knsa model wahan ssay mangwaya hy oor kitny ka mila wahan say? It is available on every mobile shop now. And online too. 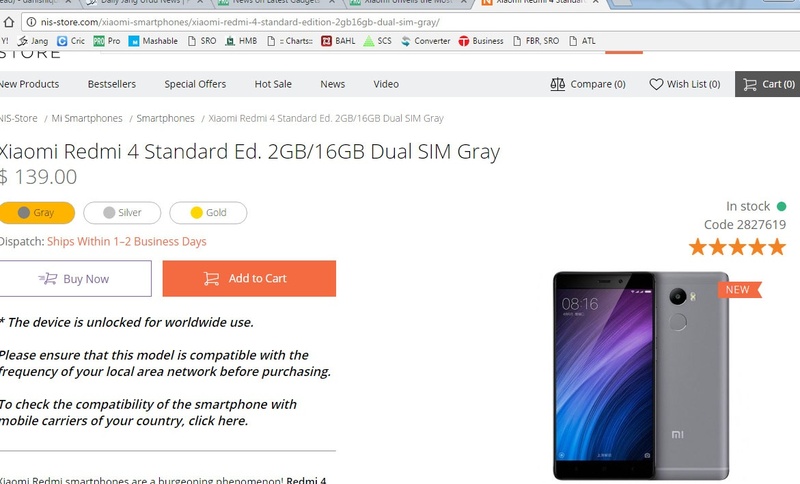 “UAE (dot) Souq (dot) Com py search karain Xiaomi Redmi Note 3. Link wali post Propakistani waly Approve nahi kar rhy warna link de deta. Ghalat suna hai ap ny. Pakistan main Launch nahi ho rhy atleast 2018 tk. Price of $104 is incorrect.